Guitarist Mat Davis (from Chatham-Kent, Wallaceburg) first made waves in the metal scene locally with his band M.A.D. (The Mad) in the early nineties. M.A.D. released a few albums through Fringe records. Mat later moved to London Ontario & did well in the band Salmonblaster. He moved to San Francisco about eight years ago & is now having a good time with Castle, alongside his girlfriend fronting on vocals & bass guitar. Mat is constantly on tour through all of the U.S.A., Canada, & Europe. This tour cycle has been expanding & repeating many times during the bands life. * Bands website link here. * Download album link here. Jordan Sterling – Guitar, Vocals, Percussion, Keys. Colin Sinclair – Bass, Vocals, Keys, Percussion. Spencer Cartier – Drums, Percussion, Keys. * Recorded during the summer of 2011 at Eyrespace Studios. * All songs written and performed by Obscure. * Additional Percussion on And Hell Followed by Josh Gyssels. * Additional Vocals on And Hell Followed by Angela Speller. * Photography by Angela Speller. * Graphic Design and Artwork by Jordan Sterling. * Recorded, Mixed, and Mastered by Bob Hiltz at Eyrespace Studios. * Download/listen to this recording here. * 2011 – Released Murphy’s Laws of Song Writing “The Book”. He has been lecturing at summits & speaking engagements around the world spreading his mass knowledge of song writing & hit song writing accomplishments. * 2011 – Ralph appears in the Canadian Indie Charts with a No. 1 song ‘Working at Christmas’, performed by Paul Brady and Terri Clark, written by Keith Donald, Ralph Murphy, and Paul Brady. * 2011 – Ralph receives the Jo Walker-Meador International Award. * 2011– Ralph co-writes ‘Guilty’ performed by Doug Gray. Album: Soul of the South. * The band released a three song sampler online. Tracks: 1. Breaking Point, 2. Runnin’, 3. Two Faced. * They followed it up with a six song release entitled Extended Player. Tracks: 1. You own your future, 2. Runnin’, 3. Elitist, 4. Breaking Point, 5. Two faced, 6. Acceptable Losses. 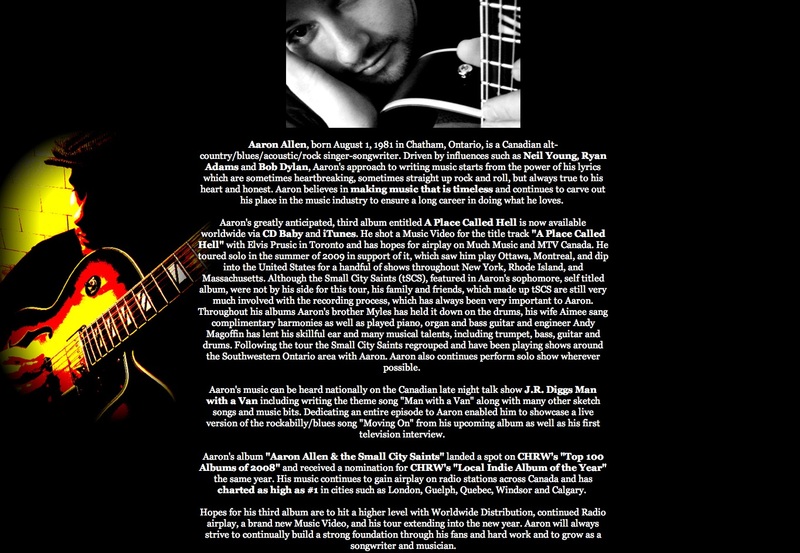 Notes: In July of 2011, Aaron Allen quietly released 100 copies of a solo album entitled “IV”. This album features 5 solo songs and one song featuring the Small City Saints. He wanted this album to have a more striped down effort, full of heart and not production. This cd is available by request only at this time. You are currently browsing the archives for the 2011 Music category.